Whether you strive to be the next Carey Price or Henrik Lundqvist, find the equipment you require to help you on the road to stardom. 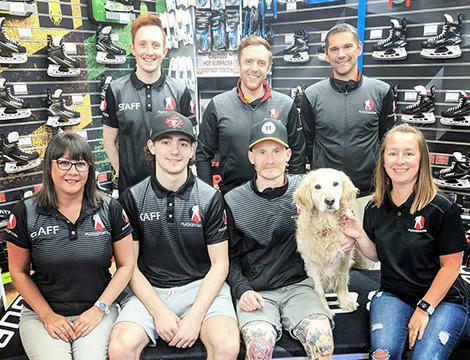 We can provide you with all of the Goalie gear you need to dominate between the pipes, in the UK's largest dedicated Goalie zone. Our son began playing ice hockey back in 1994. The idea for Puck Stop stemmed from our struggle to find hockey stores with knowledgeable staff and reasonably priced equipment. We are players ourselves; we understand what players need. So, just a year after our frustration began, we launched Puck Stop, our family-run hockey store. Most of our staff are current or ex-players, giving us the perfect insight into what our customers need. Why choose Puck Stop for your ice hockey goalie kit? We have the largest dedicated goalie zone in the UK. In such a vital role, we know having the right ice hockey equipment to shine between the pipes is immensely important. 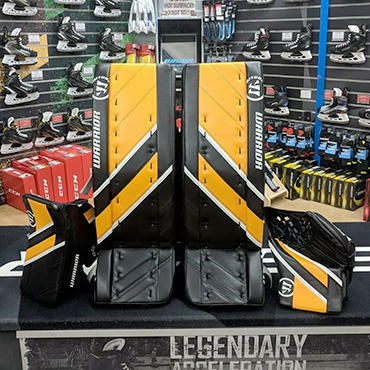 We stock all the premium brands such as Bauer and CCM, so our online hockey shop is the ideal place to find all your goalie gear. From ice hockey goalie leg pads right through to masks and chest protectors, we’ve got it all. 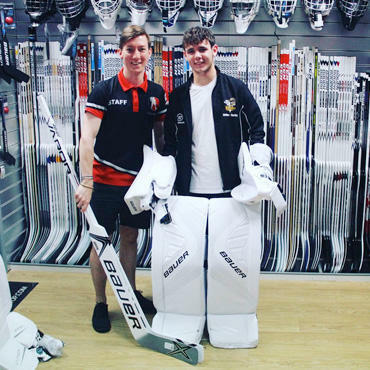 We offer a wide range of sizes and prices, to cater for all goalies - pee-wee to pro. We provide tailor-made goalie equipment just for you. At Puck Stop, we also offer custom goalie gear. You can design and build your own leg pads, blockers and catch gloves - allowing you to customise your goalie kit for the perfect fit, performance and to reflect your personality. Our priority is to provide specialist information so you make the best choices for your type of play. Downloading the CCM Custom Spec Catalog to guide you through the customisation process is a great place to start. We want our goalie customers to make informed decisions before purchasing. As players ourselves, we review and provide key insights into the products we sell. Head to our evaluation of the CCM Premier II Pro Catcher for more information on this popular catcher. Our expert staff make recommendations. Along with our custom ice hockey gloves and blockers, one of our favourite products is the pair of TRUE Pro Custom One-Piece Goalie Skates. Our team of expert TRUE skate fitters utilise the TRUE scanning technology and create a 3D scan of your feet. You can choose custom options to build a skate that provides a truly custom fit. This ensures zero energy loss and responsive power transfer, enabling you to get across the crease even quicker. Free delivery on orders over £100 to mainland UK. What’s more, your order will be despatched for next working day delivery.